Paul Williams is a Samoan International and son of All Black legend Bryan Williams. Standing at 6 foot 2 and 105kg Paul is a very intimidating player to tackle for the average man. He possesses the skill, power, and pace of a world-class fullback and through his career has had 38 provincial caps for Canterbury and Auckland, 43 Super Rugby Caps for the Highlanders, Crusaders and Blues, 19 caps in the English Premiership with Sale Sharks, 60 caps in the Top 14 French competition with Stade Francais and 18 caps at International level for Samoa. Born and raised in Auckland New Zealand and 1 of 4 (1 Brother and 2 Sisters) entered the game as a 6-year-old with Auckland club Ponsonby. Living alongside a park and playing with his older brother and friends was the starting point for his career. I was lucky enough to play alongside Paul at club level and against him at Provincial. I much preferred it when he was on my team. Not only is he a top-level athlete he is a family man, great guy and very humble. Recently I caught up with Paul to ask him a few questions; please enjoy. Firstly, Paul, you have had a lot of success in Rugby. What has contributed to that success? I feel I have a reasonably good work ethic and can demand high standards of myself. I am lucky to have a supportive family who has encouraged me and helped me focus on rugby. Early in your career, you had a few setbacks with regards to injury. Can you tell us a little about your experience and what your thought process was? Seven games into my debut Super Rugby season with the Highlanders I managed to break my leg (compound fracture of the tibia and fibula) playing against the Blues- a small consolation was that it was the only defeat the Blues had that season. Typically it is roughly a 6-month injury, but it ended up being over two years before I would attempt to play again and with the leg still not being right, three years before I was able to resume my career. I would have seen 3-4 surgeons, 4 or more sports doctors and about the same again for sports physios but they all didn’t manage to diagnose that I had a low-grade infection (from the infected wound at the initial injury) which was preventing the bones healing and causing my discomfort. The infection was picked up by a simple blood test. I ended up having 5 operations (along with 1 or 2 other periods of immobilizing the leg)- 2 operations at the time of injury to place a rod in the Tibia and to clean the wound, 1 operation to re-break and plate the fibula, 1 operation to remove the locking screws at the ends of the Tibial rod, and 1 operation to remove all the metalware once the infection was discovered. I went on IV antibiotics for two weeks, and after this final operation, it was a matter of weeks before I was back playing. Having been on contract for Auckland for most of this injury period, they were understandably not interested in resigning me, but I was lucky enough to be presented with the opportunity to sign with Canterbury for three years. I resumed my pro career with the Canterbury NPC team in 2006, and was selected in the Crusaders 2007 squad but didn’t take the field (I needed a fair bit of time to get the body and mind back up to speed). Drafted back down to the Highlanders for 2008 I played every game, was named their Back of the Year and was selected in the All Blacks training squad before the IVECO June test series against England, as well as being called into the team to cover injury during that series. I warmed up with the team and would have played if Mils Muliaina hadn’t got through the warm-up (he had a hamstring niggle). The three year injury period was undoubtedly a challenging time. The medics often had the opinion that there was no reason why I shouldn’t be back to full fitness in a relatively short time (say 4-6 weeks), I was selected with the Highlanders in 2004, Blues Development 2005, and the Highlanders again in 2006. This was a double-edged sword- being around these professional teams meant I had access to excellent sports medicine and trainers, but it was also a very long time not feeling a full part of the group and doing all the hard conditioning only for setbacks to deem it useless. With all my long-term injuries I like to immediately try and break the time down into smaller targets and goals- For example, when I want to be off crutches, walking, jogging, running, game simulation, etc. This is also set with measurable strength and fitness goals in the gym. What exercises did you do that helped you return to full fitness and advice for young players? I have always followed quite closely the advice of the medics as far as rehab goes. After my experience with my leg, I have also certainly learned to question a lot of things and not merely accept every medical professional’s opinion as to the right one. A big part of the rehab for this injury was strength work for the legs, in particular trying to rebuild the size of the quads and calf muscle, and a lot of proprioception and balance work. I am of the opinion that young players are lifting far too heavy without the right focus on technique. At 18 I already had stress fractures of the lower back. This saw me spend some valuable time learning about the core, posture, and transverse abdominal. I would highly recommend to young players to acquire these pilates type exercises and related movements where you’re focusing on controlling your posture and core. Why did you decide to leave New Zealand rugby and play abroad? As I began to be aware that I could make a living out of rugby, I also knew of the opportunity to travel and play overseas, and this idea was always attractive to me. I already had my brother playing in France after having enjoyed stints in Italy and Ireland. He was also playing for Samoa which presented the opportunity to both playtest football together. I had concluded opportunities, selections, and form that the All Blacks had most likely passed me by, and the chance to play in the 2011 Rugby World Cup for Samoa was a big drawcard which saw my debut for them at the end of 2010. Dad had coached Samoa for ten years, so growing up I followed the Samoa team very closely and looked up to many of the players. You have played in New Zealand and abroad specifically Sale and with Stade Francais. What are the differences in competitions? Players, pace, skill if any? It is always difficult to compare across competitions and countries as its very dependent on what team you link up with. The year I joined Sale they had 18 new players, the coach got sacked mid-way through the year, and 24 of us left at the end of the season! It was a similar turnover of players and coaches at Stade Francais for my first 2-3 seasons, along with playing out of a temporary stadium while the team’s traditional stadium got demolished and re-built. So its difficult to make sweeping statements as certainly not all sides were going through these issues. The advantage of New Zealand as compared to the English and French competitions is the standard of coaching and player development. 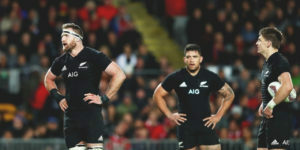 I believe this benefits the players to have a greater understanding of the game and they have been challenged to develop their skills to be able to play a more expansive style of rugby, which is regularly demonstrated by the dominance of the All Blacks. There are some outstanding players in England and France, and I believe the standard of rugby is very high, but there are players in both competitions without the depth of understanding of the game which both presents opportunities for opponents to expose and limits the ability of some teams. A reason NZ coaches are so sought-after abroad. What are your plans for the future? What would you like to do after rugby? I am currently nearing the end of my 13/14 professional season. I can see myself continuing for a few years yet by which time I look forward to a great long holiday and enjoying retirement! I have a young family, and I have a great desire to be as involved as I can be and help my kid’s early childhood development. My wife Helen is keen to resume her working career, so after having her following me and my job around I’m happy to have her work opportunities dictate whats next for us, and I will find something to do along the way. Perhaps putting my business studies (completed a Bachelor of Business degree, majoring in accounting through Auckland University of Technology) to use in some form of eco-friendly business or get involved in a community development type role.